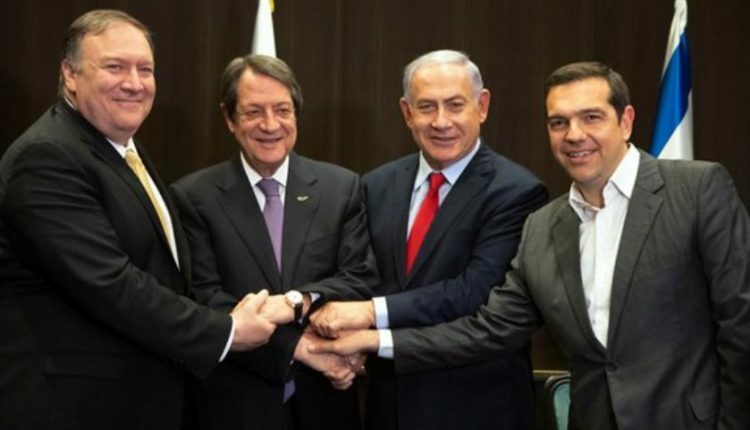 The Prime Minister of Israel, Benjamin Netanyahu, the Prime Minister of Greece, Alexis Tsipras, and the President of Cyprus Nicos Anastasiades, as well as US Secretary of State Mike Pompeo, who participated in the work of the Summit held in Jerusalem, stressed the great importance of the trilateral cooperation of Cyprus – Greece – Israel for stability and prosperity in the region. In a brief reference before the opening of the session, the President of the Republic said that “today is a great moment and I want to thank my good friend, Prime Minister Netanyahu, for convening this historic meeting in Jerusalem. We are delighted to have the US Secretary of State with us. His presence is tangible proof that our three countries are a reliable partner in the US, particularly in the energy and security sectors, as well as a stability pillar in the Eastern Mediterranean. Our vision and actions for an Eastern Mediterranean energy corridor are an excellent example. I want to assure you of Cyprus’ unreserved commitment to this credible and stable partnership that aims, through concrete actions, to create the necessary security, stability and prosperity in our turbulent area. This is our large-scale vision and we are extremely happy that the US Secretary of State is here to adopt the importance of this on behalf of the US and I am looking forward to a productive debate on issues of common interest, such as energy security, sovereign rights and the protection of energy and maritime activities and, of course, alternative energy sources”. For his part, Prime Minister Netanyahu noted, among other things, that “today is the 6th Summit among the three countries and is one of the best regional partnerships worldwide. We work in areas ranging from fire fighting, to Energy. We plan to create the EastMed pipeline from Israel, Cyprus, to Europe, which will provide stability in the region, prosperity for our peoples and provide alternative energy sources for Europe. The presence of the US Secretary of State is important and shows that the US supports this regional effort”. He added that “in this partnership we would welcome not only the US but also other countries”. In turn, the Prime Minister of Greece said, inter alia, that the three countries’ cooperation is strategic, especially in the areas of energy and security. He welcomed the US support for this cooperation, noting that the presence of the US Secretary of State strengthens efforts and dialogue on energy, security and the economy, as well as on the challenges ahead. He added that the vision is to create a safe energy transportation network from the Eastern Mediterranean to Europe, from Israel, Cyprus, Greece, to Europe. He also said that the creation of the East Med pipeline could also help the dialogue on security and economic development in the region. Finally, the US Secretary of State said, inter alia, that he spoke a week ago in Houston, USA, to a large group of heads of energy organizations and the opportunities that are being developed and on building a beneficial infrastructure that will yield great benefits. He added that “the US, Israel, the Republic of Cyprus and Greece are important key partners in security and prosperity and I look forward to our talks tonight. By working together on these important energy issues, I know that security and prosperity will improve even more between our countries. We are free countries, with free-markets, working together and working to create energy infrastructure, and then most security follows. If we do it properly we will attract investments and maximize these resources in a way that good infrastructure in free markets always brings about”. From the Cypriot side, the Minister of Foreign Affairs, Mr. Nikos Christodoulides, the Minister of Energy Mr. George Lakkotropis, the Government Spokesman Mr. Prodromos Prodromos and government officials also attend the Summit.